When prayer removes distrust and doubt and enters the field of mental certainty, it becomes faith; and the universe is built on faith. of guided meditation and spiritual renewal. Focusing on meditation and spiritual inquiry, the Full Moon Sangha is open-hearted and open-minded -- we respect all perspectives and faith traditions. We represent no specific ideology or lineage. We are wholly independent and unaffiliated. Our mantra is freedom. We are simply committed to two principles: that each of us carries embodied wisdom, and that meditation is a remarkably effective method for unlocking that wisdom. We are called the Full Moon Sangha because just as the full moon brings light into darkness, so too meditation brings wisdom into ignorance, healing into suffering, serenity into anxiety, joy into sadness, and love into loneliness. Like a full moon, our gathering will illuminate all paths. Sangha means community in Sanskrit. Whether you are brand new to meditation, or a seasoned meditation practitioner, meditating with others amplifies the depth of our meditation in ways we cannot quantify or explain. It’s simply something you have to experience for yourself. Join us for a sacred hour of renewal, healing, deepening, connecting, and freedom. 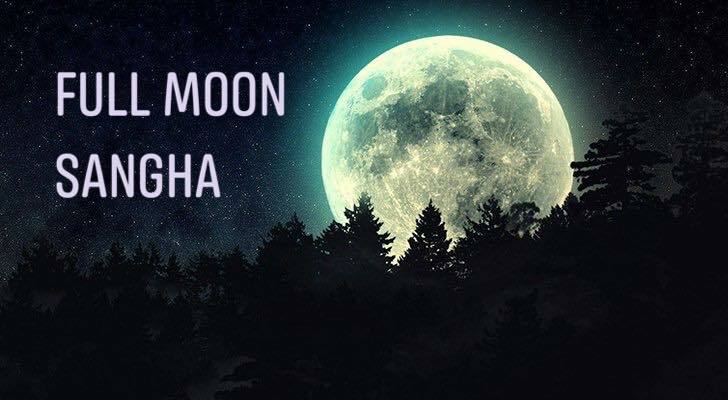 Join us for the Full Moon Sangha.